What has Danish multi-sport athlete Peter Klaris learned after 130 marathons, tackling long-course triathlon, and crushing big challenges like competing in five marathons in five days? That he keeps finding new ways to get inspired in endurance sports, and how the lessons he learns there continue to enrich the other aspects of his life. Oh, and that SportTracks is an awesome training platform! Ellen: So Peter, let's start with your current training goals. Tell us a little about what you've been up to recently, and what you're preparing for this fall. Peter: My triathlon season is wrapping up and is ending in Amsterdam in September with a half Challenge event. Luckily, I was drawn out in the lottery to participate in Marine Corps Marathon in Washington DC the last Sunday in October and New York City Marathon first Sunday in November, so my race season is extended this year. Ellen: Wow! That's some serious marathon lottery good fortune, for sure! And an incredibly action-packed racing season! We wish you all the best with your upcoming half AND your back-to-back iconic American marathons! (Also, our office is just a few hours away from Washington DC if you would like to pop down for a visit while you're stateside.) It seems that long-course triathlon requires a lot of time-intensive training across the three disciplines. Would you share some tips and strategies for keeping your training well-rounded and balancing it with work and family responsibilities? Peter: My best tip for tackling the family-work-training triangle is that I always keep running and swimming equipment in my car, so if the opportunity raises for training I'm prepared. Besides that, I sometimes work in my spare time, meaning that I'm sometimes able to squeeze a little training into my workday. I tend to prioritize training over work especially in the last couple of months leading up to a goal event. Ellen: Understood. I would be lying if I told you that I haven't occasionally prioritized a long run (or even a post-long-run snack) over showering for a work meeting or something like that. I feel validated in doing this, given that I work in the fitness/running industry. #jobperks ;) But enough about me! Let's talk about your multi-sport career. What's your strongest triathlon discipline, and what's your weakest and most challenging? And which is your favorite? Peter: Running is my thing. Swimming is tough to really master, and it is where I have my largest improvement potential. Biking is a discipline that I have learned to love over time. I like that I can bike even when all the miles in the running shoes are tough on my almost 50-year-old body. Ellen: It sounds like we have very compatible triathlon strengths and weaknesses here, Peter! I'm also a self-described running enthusiast who also enjoys the lower impact and intensity of the bike, and I have the most room for improvement in the pool. I think it's really neat how triathlon creates a very balanced and well-rounded brand of fitness that seems to be kinder to our bodies than focusing exclusively on a single discipline. How did you find triathlon and do you have an interesting triathlon origin story? 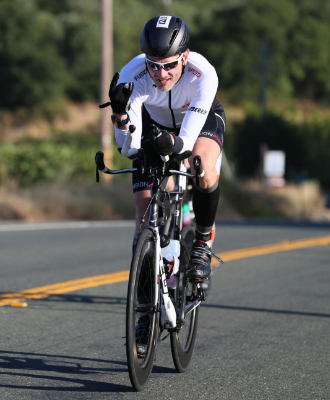 Peter: I am drawn to triathlon because it provides a fun way for me to test and improve the limits of my fitness and experience new and interesting places at the same time. I appreciate how I can strike both the travel and fitness/endurance birds with one stone, if you will. Ellen: Agreed! Destination races are my very favorite way to see new places, and I love how training for them keeps me motivated to chase new fitness goals and allows me to connect with my local running community. OK, let's talk fueling. What's your approach to nutrition in long-course triathlon, and have you ever struggled with salt or hydration? Peter: Nutrition is the fourth triathlon discipline, and I tend to underestimate the necessity of it. But somehow my body usually tells me what to seek in the aid stations, so I don't think that I ever have struggled with salt or hydration. But I am reading several books on the topic and have scheduled an appointment with a sport nutritionist. Ellen: It sounds like you must be doing something right if you have avoided issues such as cramping and bonking thus far! But it's good that you are also taking proactive steps towards learning more about your unique fueling and hydration needs. Perhaps we can set up a follow-up interview to find out more about what you've learned from your reading and working with a nutritionist. Have you found your ideal race distance, and if so, can you tell us about the process of finding it? Peter: After more than 130 marathon races, I believe that a marathon is my ideal race distance. However, I have to admit that I don't find finishing a marathon as challenging and intriguing as I once did. That's how middle distance triathlon has come to be my "new black". It provides the excitement and challenge that seems to be missing from the marathon for me these days. Ellen: Yes, 130 marathons seems like enough to really have the 26.2 distance all figured out. And that is an incredibly impressive marathoning resume, to boot! It's great that you've found middle distance triathlon to keep things fun and interesting, without having to step away from the marathon distance altogether. What is your proudest athletic achievement and why is it so special to you? Peter: It would be easy to say my first Ironman or fastest marathon race, but so far in my sports life I would say that I am most proud of the time I completed five marathons in five days. Finishing each race faster than the next, with a time of 3:29 for the last one demonstrates that our bodies are capable of so much more than we think. I think that's really cool. Ellen: Yes, that is a very badass and awesome thing to proud of, for sure! I find it hard to imagine completing five marathons in one year, much less five in five days! And the fact that your times got faster each day is just icing on an already very impressive cake! We at SportTracks salute you for this and for all your extraordinary athletic accomplishments! What is the greatest life lesson triathlon has taught you thus far? 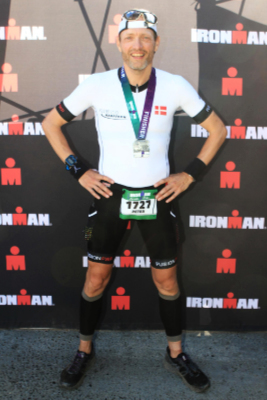 Peter: I feel that discipline triathlon requires has brought me an extra gear of energy and organization, which I can apply not only to my training, but also in my family and work life as well. When it gets tough I just know that I haven't reached my max limit yet. Ellen: Yes! I agree that my participating in endurance sports has taught me a level of structure, discipline, and energy that I can apply to other areas of life! Isn't it funny, and kind of cool how this thing that we pour so much time into can actually improve the quality and efficiency of the time we spend elsewhere? But I digress... What advice you would give to someone who is tackling long-course triathlon for the first time? Peter: Struggling through a long-course triathlon for the first time is crazy. Plain and simply crazy. It is hard to "read" what you should expect because it is just impossible to be prepare for the physical and mental task of "the big one." So, just relax, trust your training, and enjoy the life experience. I envy those who are preparing for their first one. There's just nothing quite like crossing that finish line for the first time! Ellen: Wise words, no doubt. It's true that it's impossible to know what to except as far as pacing and effort with these things without actually experiencing them for yourself. Hopefully all you rookie triathletes out there can take Peter's advice to heart and just revel in the thrill of experiencing your very first race! It's been great learning all about your running and triathlon career! We would love to know more about how our app fits into your training. Tell us how you discovered SportTracks, and what made you decide to subscribe. Peter: I started using ST before the wave of sports web application came by, and I have 11 years of recorded training on the app. I subscribe to the online version as well because I love to have access where ever I am and on whatever platform available. Ellen: That's so awesome! We really appreciate your long-term usership, and we're so glad that you find SportTracks to be accessible across a variety of platforms. Thank you for the good words! Do you get anything from SportTracks that you don’t get elsewhere? Peter: In my book, ST was a first mover on several of the features which are now universal across fitness tracking apps. I also especially like and appreciate the analysis functions that you all offer! Ellen: Nice! We do put a lot of thought and emphasis on providing our users with new and interesting functionalities and metrics that aren't available elsewhere. It's really great to hear that folks out there recognize and appreciate that. OK, one last question, and then we'll let you get back to training! What's your favorite feature in SportTracks? Peter: I have been using ST for the entire duration of my tenure as an endurance athlete. It started as program for PC, and now its features are available both off line and online. My favorite is the “compare routes” feature. This allows me to review and compare various workouts I've done on the same route over the course of a training cycle. I find it very useful for quantifying my fitness gains over the course of a training block. Thanks for reading out this post! You can meet more of the personalities in the SportTracks community by checking out our recent articles with James Curly Williams, Jack Rebours, and Charlyn Chapal. Based in Denmark, Peter Klaris is a prolific endurance athlete with over 130 marathons in the books. Even after an enormous amount of training and racing miles, he's still discovering new challenges and sources of inspiration.